To the layperson, any notion of a second, third or fourth brain is every bit as confusing as it ultimately proves ingenious. What issues from the understanding of these emergent biological phenomena however, is a creeping recognition that medical science and our knowledge of who and what we are as a sentient species, is once again being challenged to its very core. To those who welcome such a psycho-intellectual reboot as a necessary and healthy factor in the evolution of consciousness, all is well. To those however, who would prefer to reflex into arcane gnosis and remain blinkered within the Cartesian-Darwinian construct of reality, all is most certainly not well. That is because such revelations, augured via the superhuman insight of academic minds like Marco Ruggiero threaten to eviscerate the old binary world-view, whether we like it or not. An evisceration not just within the field of molecular biology, but across the entire bandwidth of human expression. This disruptive intellectual flashpoint is entirely appropriate, at a time when our world and the creatures upon it, are undergoing such radical shift. The unfolding dawn of this 21st century emerges from an epic thirteen thousand year galactic underpass of a vast time-cycle known as the grand precession of the equinox. Humankind staggers blinking into the sunlight with little or no knowledge of who we are, where we come from or indeed where we are headed. We somehow vaulted from thatching roofs and pitching hay a few decades ago to constructing billion dollar particle accelerators, devising nano-robotics and sending probes to Mars. Apocryphal stories from the ruddied pages of the Torah, the Koran, the Bible and the Upanishads do battle with our mortal soul….clamouring for attention and resurrection within a gestalt dizzied by the aggregated white-noise of millions of confounded souls. The fiction of government, a systemic socio-cultural residue of generations of priestly and kingly lines, wages war with the common herd, violating common sensibilities, and rendering humanity mute and moot in equal measure. Earth-changes, be they natural or geo-engineered, wreak havoc with economies and communities from pole to pole. A trillion dollar conspiracy of economic and pharmaceutical interests, under guise of ‘authority’ overturn the wisdom of ages and uniformly permit commercial racketeering and gross negligence bordering on industrial manslaughter in hospitals, clinics and dispensaries across the globe. Health sovereignty is usurped by indentureship to banks, bankers and banking, under colour of law, and enforced by governance: municipal, federal and multilateral. This is not the world most of us agreed to. That much unites us. Sustainable technologies and solutions which could revolutionise our world in an instant, from war and scarcity to peace and prosperity, are smothered into oblivion by statutory regulations and compliances.These ordinances and codes are upheld with grim ferocity by a relatively modern class of hominid known as the ‘bureaucrat’. This self-regulating, self-serving mandarin of the status quo unilaterally serves the elevation of systems and profit over human beings. Always did, always will. Until the greater ‘we’ determine otherwise. Unless we do so by manifesting a natural, righteous and life-affirming order of things which makes the old order of things obsolete. Which is precisely why I am so feverishly enthused by what is now emerging through the laboratory of Dr. Marco Ruggiero, MD, PhD., and his research partner Dr. Stefania Pacini. For it is such discoveries which herald a new and inalienable shift toward the elevation of consciousness and sovereignty for all peoples of the world. Discoveries like the ‘third brain’ which are first born in the mythic recesses of intuited imagination and then steadily proven out, upon a staggering body of research, impart to us extraordinary knowledge. Like the fact that we are less than one percent human, if you factor that more than 99% of the DNA contained within us, belong not to us, but to the microbes which we effectively host. If the discoveries of longitude and latitude, DNA and RNA, gravity and relativity have been of any consequence in the human journey of discovery, then I will hazard that the most recent innovation by Ruggiero is set to relegate those great accomplishments as appetisers. I use hyperbole because the discovery he has made, at the fulmination of 35 years of pioneering research and insight, is entirely worthy of such language. But first I will digress, and speak to the genesis of the personal relationship which I am humbled and graced to share with Marco and Stefania. For almost twenty years I have had the good fortune to meet with countless brilliant minds and hearts. Indeed, the core remit of Humanitad which I established in 1999, was to invite a new era in planetary innovation and leadership. To seek out remarkable souls, promulgate their cause and augment their voice upon the world stage. Our stable of eminent fellows, advocates and colleagues ranges from sitting heads-of-state, religious leaders, military and intelligence strategists, diplomats, astronauts, economists, theologians, explorers,…. to social activists, political activists, conspiracy theorists and factualists alike. We are not shy of controversy, provided it is anchored in the dispensation of truth and pursuit of natural justice. We have engaged with government and military figures, including within the ambit of the United Nations, on enigmatic matters which fall way beyond the norm, including; exo-politics, trans-dimensional phenomena, free-energy, etc..
Humanitad has placed itself at the arc of the curve in breakthrough technology and innovation, as well as in the defence and protection of scientists and doctors, promoting noble advancement wherever we have been situated to do so. At the same time we act as a body which advocates for truth and natural justice. Especially so in a world where non-institutional medical cures are demonised and outlawed as a bureaucratic reflex. A culture which does not represent human sensibility, or the natural flow of life, but rather advocates the interests of often malevolent institutions in service of private agendas. Cancer, of course, is the big taboo in the arena of medical science. It is well known that the prevailing attitude toward dealing with the big ‘C’ is outrageously outmoded and caters principally to the Cancer Act of 1939, wherein a group of conspiring British parliamentarians voted to serve their own vested interests in the burgeoning business of radiotherapy. Thus we inherited a nefarious pathology of control toward treating the biggest unnatural killer of all. Millions of souls continue to die as they are forced to subject stricken bodies to the perils of chemotherapy. This entirely unnatural chemical protocol is dispensed by health and medical officialdom to patients, or is it customers? – worldwide. This, despite a success rate so atrociously unsuccessful that it would have the purveyors of any other medicament thrown behind bars – probably on charges of wilful manslaughter. Like ‘waging war for peace’ that other civilisational meme which afflicts our cognitively dissonant world, poisoning to heal is a damned nonsense and an insult to human consciousness. These same ‘authorities’ enjoy the audacity of outlawing cannabis and countless herbal and natural remedies which are evidenced to positively alleviate if not cure cancer and degenerative illness of all descriptions. Such organisations and their functionaries are further empowered by multilateral institutions like the World Health Organisation within an embrace of questionable treaties engendered by the UN and the EU et al. They are ensured by profoundly disturbing protocols such as Codex Alimentarius and enforced through agencies like the AMA and the FDA, which dispense a draconian authority to strike fear in the heart of good doctors and healers alike. 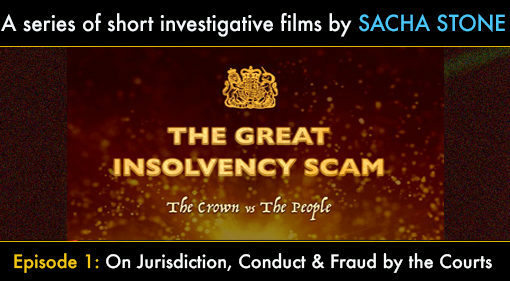 It is a worldwide complex of intimidation and coercion which appears unrepentant in its task whilst permitting billions of lobbyist dollars in scaling-up a statutory cobweb of mandatory compliances, restrictions and threats. Walking through almost any supermarket anywhere in the world today and you will discover thousands of products arrayed which contain legal poisons which are entirely detrimental to human health. From aspartame, sulphates, preservatives, sugars, fluorides to common table salt and processed foods in toxic containers and packages leaking heavy-metals and plastics. Where are the regulatory authorities here? How utterly shameful and egregious that we (billions of wilfully ignorant voters and consumers) permit this travesty to continue in the 21st century. In future times one imagines we will, as a species, take a deep pause to reflect on the scale and horror of this historical tragedy. One which conjures the gravest and darkest song within the human soul: that of sacrifice of innocents. How many of our noble doctors and medical practitioners, naturopathic healers and carers have had lives and careers destroyed by prevailing ‘systems’? How many private fortunes continue to be made in the profiteering and racketeering which saturates a truly sick ‘health industry’? On the other hand, how many courageous pioneers in the medical sciences continue to labour relentlessly at their microscopes, their computations and their alchemical insights? How many of them continue to dodge bullets and intimidations by pursuing common sense and empirical findings? The last patient which we (Humanitad) referred to Marco Ruggiero’s ministrations was in fact my own godfather, who collapsed in a London street at the age of 73. Later that day it was discovered that he had been living with a brain tumour the size of an orange, which finally burst in his skull. The diagnosis was stage-four brain cancer. The prognosis – ten days to live. Leading oncologists were paraded before him, slumped in a wheelchair, dribbling out the corner of his mouth. We were told he could be given a ‘sweet death’. We were told it would cost fifty thousand pounds. I urged family to get him out of the hospital immediately and into private home-care. Via the resourceful thinking of Mikael, one of our trusted family of Humanitad doctors, we reached out to Marco. Within days we were administering one of his protocols to my godfather. Sixteen weeks later there was not a trace of cancer in his blood. He turned 74. So, on an innocuous balmy day in London, some months ago, when I received a message from Ruggiero inviting me into a private and confidential conversation on a matter of “epochal importance” I was inclined to pay attention. I knew the man well enough, and had witnessed sufficient miracles at his hands over five years, to know that he was not a man given to folly, let alone over-statement. What I learnt that day, and what my team and I continue to learn in subsequent months has magnificently shaken the foundations of our conceptual framework of reality. A shakedown which has proven most empowering, enlightening and enchanting. We travelled to Sedona in Arizona to meet with Marco and Stefania in order to begin the process of ring-fencing the scientific discovery in question, and begin the process of preparing to introduce it to the world-at-large. And so to the question: what on earth could be deemed of such ‘epochal importance’? In the simplest, most rudimentary terms he has innovated a microbial formula which can not only arrest human bio-deterioration and degeneration, but will systemically reverse the effects of human ageing and extend human life to spans which we have never imagined possible. You will be excused for taking a deep breath and re-reading that last statement. The innovation consists of a natural, specially formulated microbial complex, taken twice daily as a capsule, enema or sub-lingual spray, whereupon an interaction occurs within the microbiome to significantly augment gut-manufacture of the Klotho long-chain protein….the fairly recently discovered ‘gene of immortality’. Coupled with a unique and proprietary method of delivery and thereby assimilation of the Klotho enzyme throughout the entire cellular system, the human bio-form is now poised to reverse and eradicate cancer, neuro-degenerative disease, and the effects of ageing itself. The formula will reversing those entropic effects, rebuilding and rebooting every aspect of our physiology ….and all in a single protocol. We are at the onset of a re-genesis of humankind from mortality to immortality, and all that this bizarre and outrageous notion implies. The leading lights of silicon valley are assuredly in agreement with this ‘conversation’ as the latest medical and scientific journals are becoming increasingly testament to. Notions engrained in the Atlantean and Lumurian mythos emerge once again, as well as countless Biblical passages referencing men of old living to almost a thousand years, invite us into remembering that we are still a young and stupid species every bit as much as we prefer to imagine ourselves brilliant and capable. Despite a mounting fervour of interest in the subject of life-extension, the capacity to naturally engineer human life into its immanent perfection will likely be met with much derision and confoundedness in the coming days. In a world so entrained into fear and decadence, how is a status quo propped up by the continuance of war, disease and poverty, likely to respond to a medical scientific breakthrough which promises the resurrection of humankind from death, disease and entropy? The answer is anyones guess. Perhaps only answerable within each of us…….one heart at a time. 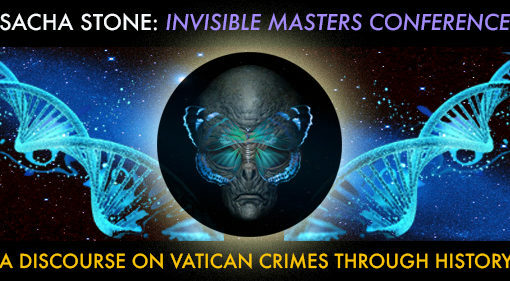 Certainly, within the conversations which we have had in recent weeks with scientists and medical minds, as they scrutinise the revelations of Ruggiero and begin to cogitate on the ramifications of what he has pioneered….we are already seeing a rekindling of hope and wonderment coupled with that sharp intake of breath. The kind of breath which we each took as babes, when first we basked in the warm sunlight, or beheld the miracle of a snowflake, or witnessed the immeasurable beauty of our Mothers eyes. The Immortalis Klotho Protocol, as it is now coined, will be dispensed for the next two to three years within a measured and strictly limited client-base in various nations. We will be studying its effects upon divergent genomes, amongst people enjoying different lifestyles, dietary configurations and set within differing environmental conditions. Humanitad will oversight these surveys in league with the Immortalis team and Dr Ruggiero’s team in Arizona, and we will publish the findings as appropriate, whilst seeking to engender a new conversation in the biological sciences. A conversation which hopefully begins with placating all cynics and skeptics by leaning in toward the wisdom of the great Socrates, wherein he acknowledged that ‘the only thing I know for certain is that I know nothing at all’. We may ultimately know nothing at all, in the fixed sense. But we do appear to be on the threshold of extending human life and the quality of that life, in order that we may have a great deal more time to continue investigating and learning the great mysteries of life on earth. So, in the spirit of human fellowship, permit me to ask you to ask yourself the following question: What would you do differently with your life, were you to discover that you could live to two hundred years of age and beyond? An excerpt of Sacha Stone discoursing on the Vatican complex as the genesis of war, disease and poverty in our times. 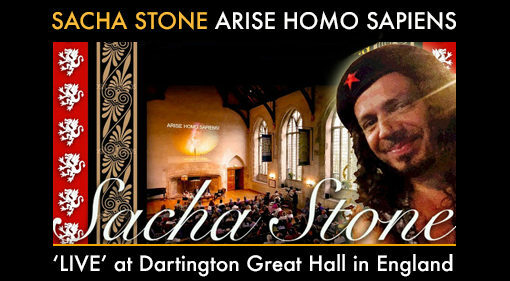 Hosted by Jason Liosatos and Louise Ashley at Dartington Great Hall. Sacha discusses latter-day idolatry and the dangers of cultural dream spell.